AudioFile goes Behind the Mic with narrator Xe (pronounced “EK-see”) Sands to tell us about her experience narrating Caroline Leavitt’s CRUEL BEAUTIFUL WORLD. When a high-profile book is brilliantly channeled through audiobook performance, it’s a gift for listeners. Our reviewer calls CRUEL BEAUTIFUL WORLD “an audiobook lover’s dream.” Xe tells us how she invested in the emotions of Caroline Leavitt’s characters. Listeners will as well. Listen to a sound clip of Xe and read our full review here! Find more recent audiobooks narrated by Xe! This month’s picks go from sweet to steamy and include some of our favorite authors and narrators. Good luck choosing just one! Betrayal and passion mix when dragon Illarion and human Edilyn meet. Conflicting magical missions make Lenna and Caine’s unwilling attraction deliciously complicated. Opposites attract as rodeo champ Tanner Callen falls for city slicker Madeline Harper. Hunted by a murderer, Francesca seeks refuge and protection from the Ferraro crime family and their unusual abilities. Pru’s secrets may ruin her relationship with pub proprietor Finn O’Riley. Julia starts a Christmas blog chronicling her efforts to befriend her curmudgeonly neighbor, Cain. Keep your must-list hot with AudioFile’s newest romance reviews. 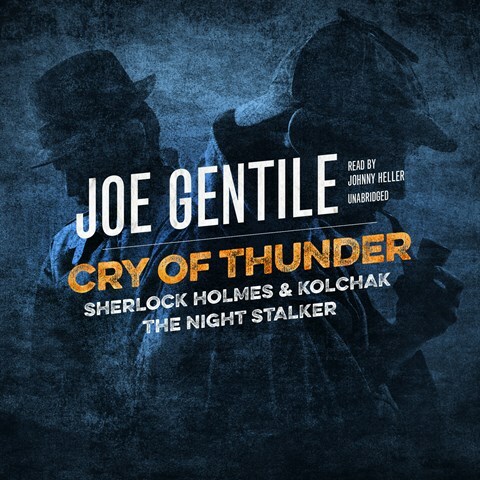 AudioFile goes Behind the Mic with narrator Johnny Heller to hear about Kolchak: The Night Stalker doing a little time-travel and getting wrapped up with Sherlock Holmes. CRY OF THUNDER: Sherlock Holmes & Kolchak the Night Stalker piques our curiosity—before the X-Files there was Kolchak. Johnny Heller has a ball with the characters—from crime reporter Kolchak to Holmes and Watson and somehow looping in cowboys of the American West. Read our full review here! Browse our newest mystery reviews to find your next great listen! Women’s friendships are the key to everything. Shasta Nelson’s advice begins with a description of intimacy that will resonate with everyone. Narrator Robin Eller makes us believe it. Explore the impact of friendship on our health and happiness. Shasta notes, “With the constant connectivity of today’s world, it’s never been easier to meet people and make new friends—but it’s never been harder to form meaningful friendships.” Robin Eller gives listeners a deeply-connected audio performance. Listen to a sound clip of Robin and read our full review here! For more SELF recommendations, browse AudioFile’s newest personal growth reviews! We know that narrator Katherine Kellgren can weave spells with her versatile voice and her prodigious narration talents. As AudioFile goes Behind the Mic, we learn about another of Katherine’s gifts when she recorded Karen Cushman’s GRAYLING’S SONG. AudioFile Editors knew the combination of Karen Cushman and Katherine Kellgren would again create terrific listening. Celebrated Cushman titles ALCHEMY AND MEGGIE SWAN, WILL SPARROW’S ROAD and now GRAYLING’S SONG make a trifecta of song, history, magic, and memorable characters. Listen to a sound clip of Katherine and read our full review here! Find more recent audiobooks by Katherine!